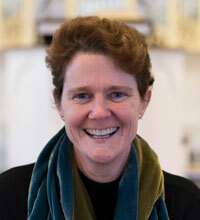 Jacqueline E. Lapsley serves as Dean and Vice President of Academic Affairs and Professor of Old Testament. She earned her MA from the University of North Carolina at Chapel Hill, her MDiv from Princeton Seminary, and her PhD from Emory University. Lapsley is interested in literary theory, ethics (especially creation ethics), theological anthropology, and gender theory, as tools for reading the Old Testament theologically. She co-authored Bible and Ethics in the Christian Life: A New Conversation (2018); edited the “Gender and Method” issue of Hebrew Bible and Ancient Israel (2016); co-edited After Exegesis: Feminist Biblical Theology (2015, with Patricia K. Tull), and A Women’s Bible Commentary, 3rd edition (2012, with C. Newsom and S. Ringe). She serves on the editorial boards of The Catholic Biblical Quarterly, Hebrew Bible and Ancient Israel, and the new Interpretation Commentary Series (with co-editors Brian Blount, Beverly Gaventa, and Samuel Adams). Lapsley is an ordained Presbyterian elder and teaches and preaches in congregations. “A Theology of Creation—Critical and Christian," in Theology of the Hebrew Bible: Jewish and Christian Readings (SBL Resources for Biblical Study Monograph; Atlanta: SBL, 2016). “The Proliferation of Grotesque Bodies in Ezekiel: The Case of Ezekiel 23,” in Ezekiel: Current Debates and Future Directions (FAT 1; Mohr Siebeck, 2016). “New Books: Old Testament,” The Christian Century (April 2016). “Reading Psalm 146 in the Wild," in After Exegesis: Feminist Biblical Theology in Honor of Carol A. Newsom, ed. Jacqueline E. Lapsley and Patricia K. Tull (Waco, TX: Baylor University Press, 2015), 77-90. “Dignity for All: Humanity in the Context of Creation," in Restorative Readings: Old Testament, Ethics, Human Dignity, ed. Bruce C. Birch and Julianna Classes (Louisville: WJK, 2015), 141-144. The Old Testament and Ethics: A Book-by-Book Survey, co-editor with Joel Green (Grand Rapids: Baker Academic, 2013). A Women’s Bible Commentary, revised, 3rd edition (20th anniversary edition), co-editor with Carol Newsom and Sharon Ringe (Westminster John Knox Press, 2012). A Dictionary of Scripture and Ethics, associate editor with Joel Green (general editor), and Rebekah Miles, Allen Verhey (associate editors) (Baker Academic, 2011). “Ezekiel,” in The New Interpreter’s Bible One Volume Commentary, ed. Beverly Roberts Gaventa and David Petersen (Abingdon Press, 2010). Whispering the Word: Hearing Women’s Stories in the Old Testament (Westminster John Knox Press, 2005). Can These Bones Live? : The Problem of the Moral Self in the Book of Ezekiel (Walter de Gruyter, 2000).